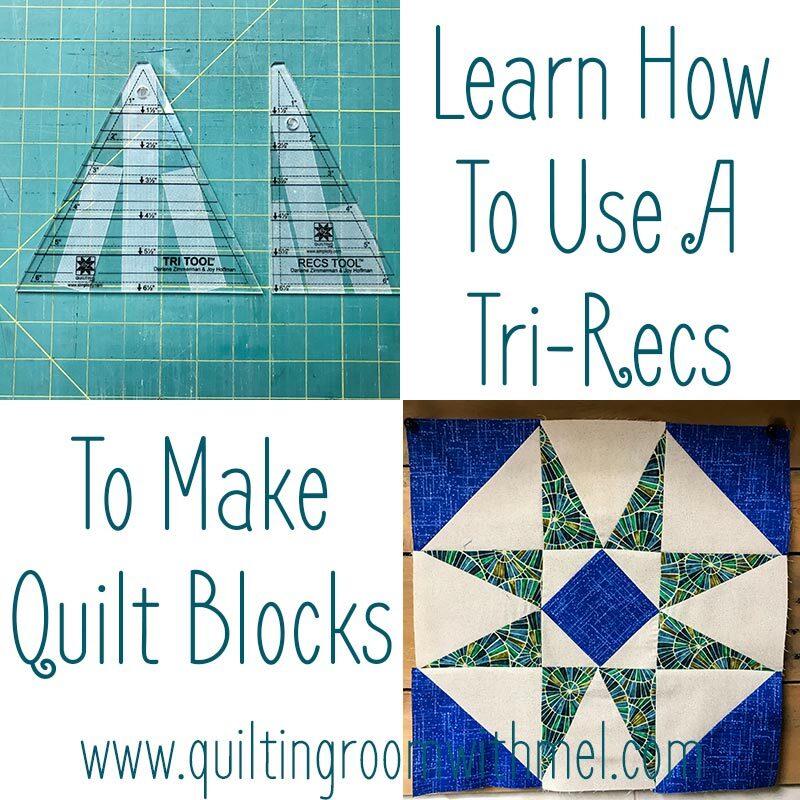 The tri-recs ruler combo is a very handy quilting tool to have. I have also found that it can be intimidating to use for some quilters. There's something in your brain when you look at the Tri Tool and the Recs Tool that says, "These do not go together." They do go together and with the "odd" parts of the ruler it makes lining up the pieces a breeze. Those little notches are the key to making the triangle in a square unit a breeze to put together. In the video, I swap the ruler back and forth for the legs. That's because I wasn't using the whole strip of fabric. If you are needing to cut a bunch you can fold the fabric in half and cut the left and right at the same time. If you just need a few do like I do in the video. I did this video for the block of the month I do for my Facebook Community. You are more than welcome to join just be sure to answer the questions so I know you are a real person. There's still time to join in on the block of the month if you would like to. The block in the graphics I call Star Daze but I must be the only person who knows it by that name because I couldn't find any quilt block online with that name that looks like the block I did. If you don't have a Tri-Recs ruler you can purchase one from Amazon. One thing I learned recently is that not all "tri-recs" rulers are created equally. The one I linked is the standard in the quilting community. There are some others out there. I was at a retreat where someone had cut their units with a different "tri-recs" ruler and their pieces wouldn't work in the blocks we were making. So while I normally say use whatever version is in your budget after seeing that quilter struggle all day long I have to say buy the one I linked. Saving a few bucks isn't worth the headaches later on when your units don't fit into the quilt block you had in mind. If you aren't sure what blocks use the Tri-Recs the star chain quilt block, 54-40 fight or flight, or Bonnie Hunter's En Province are just a few. You may notice that there is tape on the back side of my rulers. I do that to keep it from sliding. You can see what I use and how I do it, How To Keep Your Ruler from Sliding. To get more quilting tips sign up for our newsletter below.